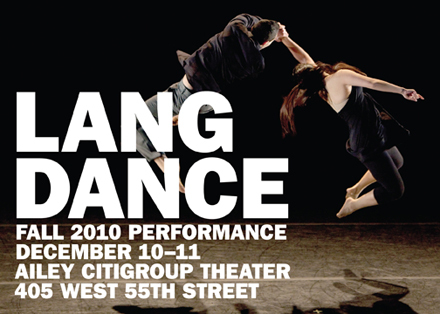 The Eugene Lang College Dance Department presents its annual Fall Dance Performance on Friday and Saturday, December 10-11, at 8:00 p.m. at the Ailey Citigroup Theater, 405 West 55th Street. Admission is $5. The performance features original dance works by faculty members João Carvalho and Ishmael Houston-Jones, as well as student-choreographed works. All pieces are performed by students of Eugene Lang College. A native of Brazil, João Carvalho continues to teach dance and develop works with his pickup dance company, L√∫dicadan√ßa, in São Paulo. He also teaches the renowned Paul Taylor Dance Company. Ishmael Houston-Jones is a choreographer, teacher, performer, improviser, curator, and writer. His improvised dance and text works have been performed in New York City and other locations across the United States, Europe, Canada, Australia, and Latin America. He has received choreography fellowships from the National Endowment for the Arts, the New York Foundation for the Arts, the New York State Council on the Arts, the Ford Foundation, and Art Matters. Houston-Jones has been a force in the New York dance world for more than 30 years.